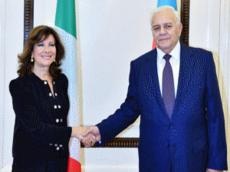 Italy considers Azerbaijan as one of its most loyal partners, President of the Italian Senate Maria Elisabetta Alberti Casellati said during her meeting with Speaker of Azerbaijan’s Milli Majlis Ogtay Asadov. Alberti Casellati noted that her visit will contribute to the development of interparliamentary relations between the two countries. She said Italy attaches particular importance to Azerbaijan's parliamentary traditions. The president of the Italian Senate recalled her meeting with Azerbaijan’s First Vice-President Mehriban Aliyeva in Rome this September, and underlined the importance of the issues they discussed. Speaker Asadov expressed his confidence that the Italian Senate president's first official visit to Azerbaijan will contribute to the development of bilateral relations between the two countries. He described Italy as one of the most important partners of Azerbaijan in Europe and in the world. Describing Italy as Azerbaijan’s largest trade partner, Asadov noted that TANAP, TAP and the Southern Gas Corridor projects increase confidence in further development of bilateral relations between Azerbaijan and Italy. He also provided an insight into the Armenia-Azerbaijan Nagorno-Karabakh conflict. Asadov said the resolution on the situation in the South Caucasus, adopted by the Italian Senate in 2010, and Rome's support for Azerbaijan’s territorial integrity are of vital importance.